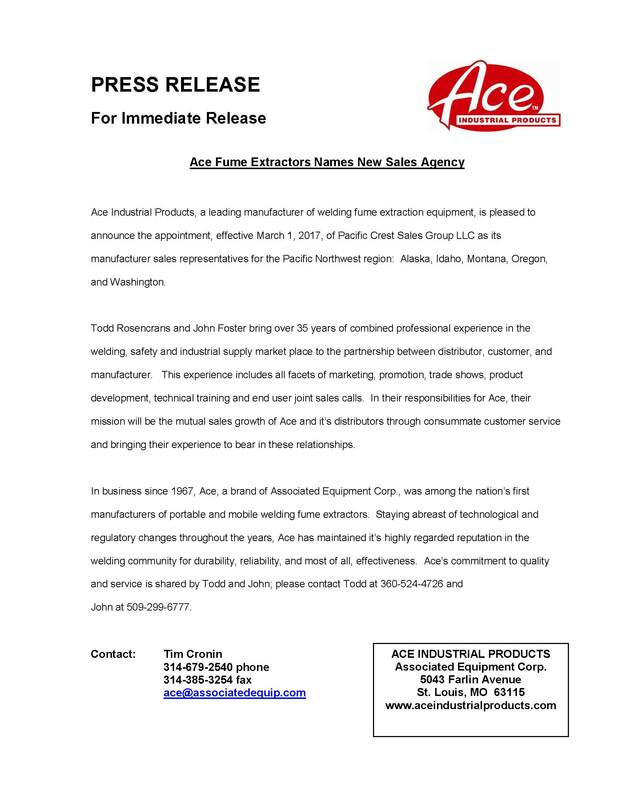 Ace Industrial Products, a leading manufacturer of welding fume extraction equipment, is pleased to announce the appointment, effective March 1, 2017, of Pacific Crest Sales Group LLC as its manufacturer sales representatives for the Pacific Northwest region: Alaska, Idaho, Montana, Oregon, and Washington. Todd Rosencrans and John Foster bring over 35 years of combined professional experience in the welding, safety and industrial supply market place to the partnership between distributor, customer, and manufacturer. This experience includes all facets of marketing, promotion, trade shows, product development, technical training and end user joint sales calls. In their responsibilities for Ace, their mission will be the mutual sales growth of Ace and it’s distributors through consummate customer service and bringing their experience to bear in these relationships. 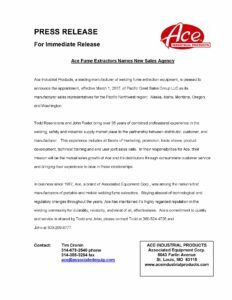 In business since 1967, Ace, a brand of Associated Equipment Corp., was among the nation’s first manufacturers of portable and mobile welding fume extractors. Staying abreast of technological and regulatory changes throughout the years, Ace has maintained it’s highly regarded reputation in the welding community for durability, reliability, and most of all, effectiveness. Ace’s commitment to quality and service is shared by Todd and John; please contact Todd at 360-524-4726 and John at 509-299-6777.